Mainers for Health Care rally outside the State House prior to former Gov. Paul LePage's State of the State address, Tuesday, Feb. 13, 2018, in Augusta, Maine. Good morning from Augusta, where Medicaid expansion is ticking on under Gov. Janet Mills and a staff at the Maine Department of Health and Human Services that has done a 180-degree turn from the new governor’s predecessor in less than three weeks. Mills, a Democrat, began implementing expansion — approved by Maine voters in 2017 but stalled by former Gov. Paul LePage through the end of his tenure — in the first full day of her governorship earlier this month. The first 500 Mainers were covered by Jan. 10. That figure has more than tripled in the ensuing week as the department sorts through thousands of applications denied during the LePage administration amid a wave of new applications. The number of enrolled people should increase heavily through month’s end. There are plenty of questions about funding. Mills spokesman Scott Ogden didn’t answer one on Monday about how much expansion has cost so far, saying cost estimates will be in Mills’ two-year budget proposal due to the Legislature in February. The governor has promised that a long-term funding plan for expansion will also be in that document. 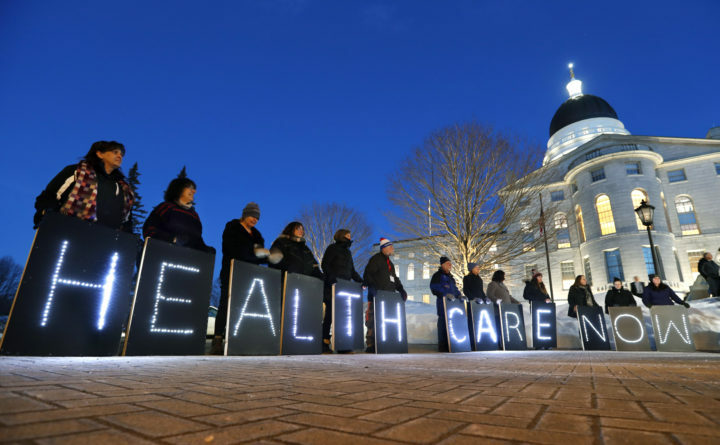 For now, the state is paying for this coverage out of surplus Medicaid funds that stood at $37.7 million as of June 30 as Maine awaits federal approval of its expansion plan, which has concerned Republicans. However, the Mills administration has faced a court deadline of Feb. 1 to implement the law and approved emergency rules governing expansion on Friday. Busy advocates are telling people who have already applied for expansion not to apply again as the department reviews old applications. The Mills administration held a roundtable meeting with expansion advocates earlier this month as it tries use existing networks to enroll eligible Mainers and avoid a large staffing ramp-up to do that work. LePage, a Republican, often said expansion would require 100 new DHHS staffers for enrollment and claims work. Now, the state is cycling back through applications that were summarily denied by the LePage administration as they fought with advocates in court about implementing the law. Earlier this month, the department said nearly 8,100 people had applied for coverage before Jan. 4. When you add that to the new applications and others on the way, Maine could have more than 10,000 people in the expansion hopper by the end of the first month — an eighth of the way to the estimated 80,000 people who would be eligible. The help line at Maine Consumers for Affordable Health Care has been busy throughout January, said Ann Woloson, the group’s executive director. Her group is telling people in a flyer not to apply again if they applied under LePage because old applications are being reviewed. Lawmakers enter their sixth legislative day, and it’s a busy one. As the Senate and House of Representatives return to session after the three-day weekend, lawmakers will also be shuffling in and out of nine committee meetings, most of which have workloads that are beginning to stack up. Committees on Health and Human Services and Energy, Utilities and Technology, for example, are contending with 36 and 12 referred bills, respectively, but neither will begin holding public hearings until next week. Today is also the 46th anniversary of Roe v. Wade, the U.S. Supreme Court’s decision that legalized abortion nationwide. In an 11:30 a.m. media event at the State House, Mills and some legislators plan to emphasize the importance of ensuring abortion and health care access. — Legislators in Maine have made property tax relief a priority, but history and competing funding demands signal that enacting meaningful reform won’t be easy. Lawmakers have submitted more than 50 bills aimed at the property tax, but Mills’ vow not to raise state taxes in the two-year budget she will propose next month could limit the scope of property tax relief efforts. Cities and towns amassed nearly $2.4 billion in property taxes in 2015, the Maine Municipal Association estimates. It’s far larger than the individual and corporate income tax or the sales tax, of which Maine collected $1.8 billion and $1.4 billion, respectively, in the 2018 fiscal year. Increasing state aid to K-12 education to 55 percent of the total cost and reinvigorating state revenue-sharing with cities and towns rank among the more common proposed remedies. — A new report attempts to assign a dollar value to damage caused by rising sea levels. The study by Columbia University and First Street Foundation, a New York-based nonprofit that studies sea level rise and its effects, pegged the value of Maine property lost to flooding caused by rising sea levels between 2005 and 2017 at $69.9 million. The total value of property lost to sea level rise in New England during the same period was $403 million, according to the study. — The partial federal government is almost a month old. Although Maine is less affected than many other states, the cumulative effects of the shutdown are intensifying here. Click here for a list of impacts in Maine. — The federal government might be shut down, but that hasn’t stopped Democratic U.S senators from announcing plans to run for president. U.S. Sen. Kamala Harris of California announced Monday that she will seek her party’s nomination. Harris will likely compete for the Democratic nomination with several Senate colleagues. Sens. Elizabeth Warren of Massachusetts and Kirsten Gillibrand of New York have both launched exploratory committees. Sens. Cory Booker of New Jersey, Sherrod Brown of Ohio and Amy Klobuchar of Minnesota are also looking at the race. Independent Vermont Sen. Bernie Sanders, who unsuccessfully sought the 2016 Democratic nomination, is also considering a campaign. Several other Democrats have already declared their intentions, including former Maryland Rep. John Delaney and former Obama administration housing chief Julian Castro. The prize was supposed to be awarded annually, but after I ran — moped? — away from the competition the next two years, they just retired it in my honor. I reigned as the undisputed champion of glumness until 2005, when Cliff Arnall, a psychologist at a Welsh university, came up with a “scientific formula” to determine that the third Monday in January is the most depressing day of the year. For those of you playing along at home, the formula is: [W+(D-d)]xTQ/MxNA – where W is weather, D is debt, d monthly salary, T time since Christmas, Q time since failure of attempt to give something up, M low motivation level and NA the need to take action. On the bright side — if such a thing exists — reading this today means you survived Blue Monday 2019. Although Arnall is now trying to rewrite history by saying it was never his intention to assign a negative connotation to Blue Monday, spending time to come up with a formula for why we’re all depressed is depressing in and of itself. The Glum Award is headed to Wales.